Shocking the pool on a regular basis is an important element in keeping the pool clear and clean. 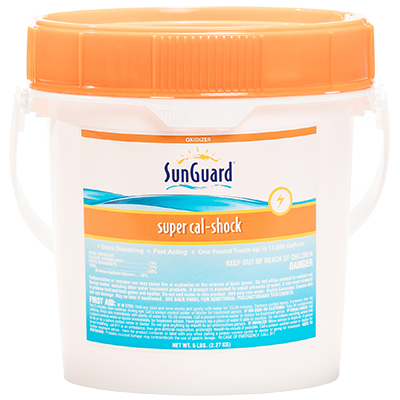 Swimmers and the environment add wastes to the pool that must be eliminated on a regular basis in order to prevent problems such as algae and cloudy water, SunGuard offers a variety of products to shock the pool. 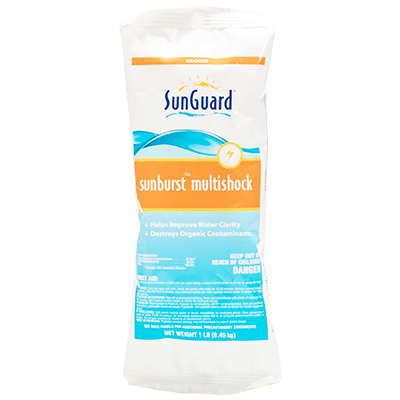 For super clear water, add SunGuard Multi-Shock once a week or as needed. 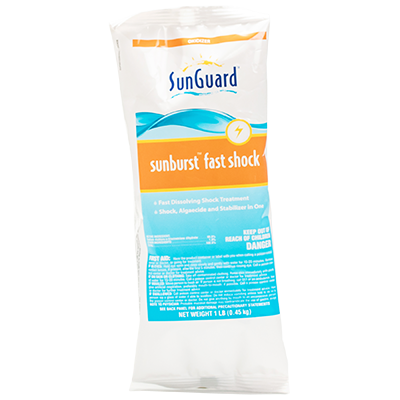 More frequent shocking is needed after rain storms, heavy bather load, or exceptionally hot weather. Premium, quick dissolving, multipurpose sanitizer. Provides effective bacterial and algae control in swimming pools. Can be used as a shock or for routine maintenance. One pound shock treats 17,500 gallons – over 50% more than regular calcium hypochlorite. Fast active and quick dissolving; no need to pre-dissolve. 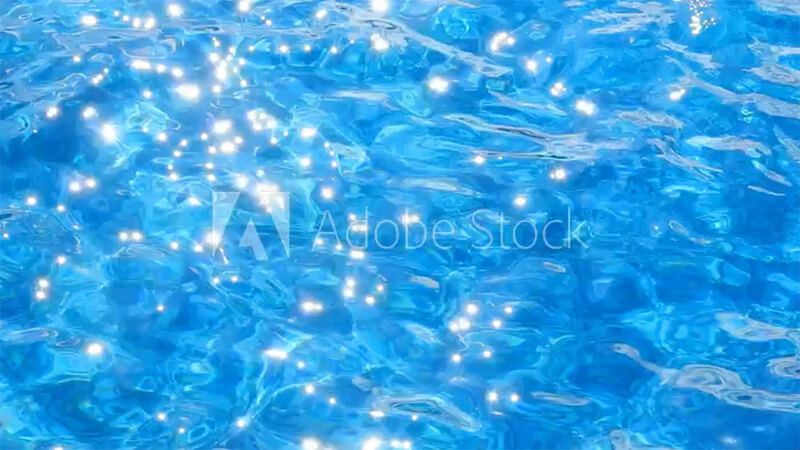 Powerful shock treatment for a crystal clear pool. When dissolved in water provides a minimum 70% available chlorine. Highly effective sanitizer that is easy and convenient to use. 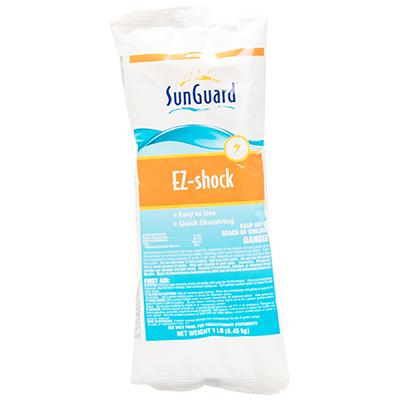 Effective sanitizer – The available chlorine is released when the product is dissolved in water and it works continually to prevent growth of algae & bacteria. 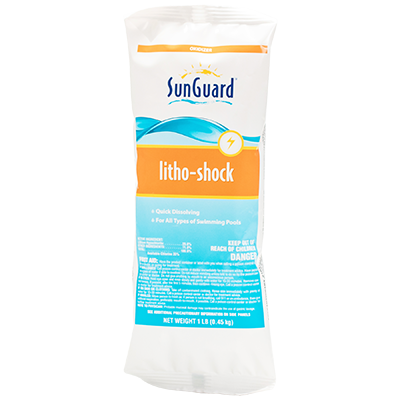 Shock treatment – Used for shocking or superchlorinating pool water to destroy organic contaminants and restoring crystal clarity to pool water. Dichlor reacts with water to release hypochlorous acid, the active killing form of chlorine that does the actual sanitizing work. 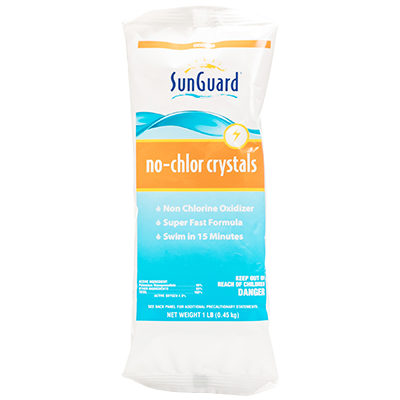 Has a built in stabilizer, which helps prevent sunlight from degrading the chlorine. Works continually to kill bacteria, control algae and destroy the organic contaminants in water. Gentle on pool equipment and ideal for all pool surfaces. This quick dissolving, non-clouding shock product. Effectively reduces organic contamination in swimming pool water and sanitizes water. Works by oxidizing the organic material in the water, eliminating chloramines. Soluble at all water temperatures; great for spring and fall. Will not alter your pH. Can be used to kill algae and bacteria as well as eliminating organic waste. Can swim just 15 minutes after use. Quick dissolving, fast acting shock that works well in cold water conditions. Self dissolving will not foam or cloud the water. Add after heavy use such as a party to eliminate organic waste such as sweat and body oils.